The fund’s style: If your asset allocation calls for investing in large value-priced stocks, you want to go with a fund that invests in large value-priced stocks. Watch out, though, because the name of a mutual fund might make it sound like one thing, when in reality it’s something else. Credit: ©2012 Morningstar, Inc. All Rights Reserved. Reprinted by permission of Morningstar. 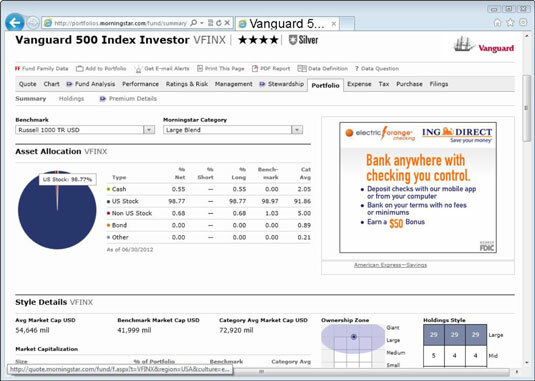 Morningstar lets you dig deeper and find out precise details about mutual funds. Long-term performance: It’s tempting to chase after mutual funds that did the best last year or in the last decade. But studies have shown explosive mutual funds are rarely able to maintain their streaks. You should concentrate on a fund’s five- or ten-year track record, at the least. If you can get performance data going back further, that’s even better. Always compare a mutual fund’s performance to the comparable index. If you’re looking to buy a mutual fund that invests in large value-priced stocks, you should compare its performance to a large value index. Turnover: It’s important to keep turnover low because when your fund sells stocks, you can face serious tax consequences if it causes capital-gain distributions. Ratings: Mutual fund trackers Morningstar and Lipper rank mutual funds based on many dimensions of their performance. Although you can’t rely solely on these rankings, they’re worth paying attention to. Size: You have a dilemma when shopping for actively managed mutual funds. When they get too large and have huge chunks of money to invest, performance usually suffers as they struggle to find enough investments to plow the money into. A general guideline on this is if you own a fund that invests in large companies, it might be getting too big when it has $50 billion in assets. Being too small can be a problem, too. If a fund doesn’t attract enough assets, it might be shut down. Fees: Fees are how much the fund charges you every year to invest your money. The fees charged by your fund are typically taken annually no matter what. That means even if the fund falls in value, you pay fees. That’s why fees are one of the most important things to pay attention to. They’re so important that the next section is dedicated to understanding them. Actively managed mutual funds tempt investors with the promise that their portfolio managers are so smart they can beat the market. The reality, though, is that very few beat the market consistently, and they wind up charging investors fees for a promise that’s never realized.